The medical term for skin tags is acrochordon. It is a tiny benign that is out pouching from the skin that is again connected to the underlying skin through a tiny stock. They look like bits of pouches hanging from the skin. The root cause behind their occurrence is yet unknown. They tend to develop when blood vessels and collagen get trapped under folds of skin. These skin tags are quite harmless. There are several counter medications that are suggested by doctors for curing skin tags. They can also be surgically removed. You can however always fall back on home remedies to overcome the problem. 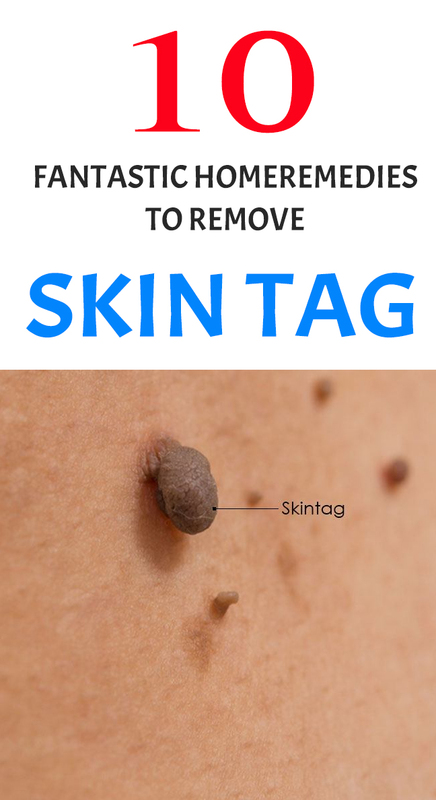 Here are some effective ways on how to remove skin tags naturally at home. Apple cider vinegar has acidic nature and it contains alpha hydroxyl acid helps in removal of the tags and it doesn’t leave a scar behind., apple cider vinegar is an effective ingredient to cure the problem of skin tags. Take apple cider vinegar in a bowl and dip cotton swab apply it on skin tags. There will be a stinging sensation for a few minutes no need to worry about it that will soon stop. Wait for 3 to 4 hours after wash it with warm water. Repetitions: repeat this remedy at least 3 to 4 times a day. Note: Who have sensitive skin type, mix apple cider vinegar with equal amount of water (before applying it). To avoid scarring. Take a baking soda in bowl then add castor oil to make a thick paste. Wait for 1-2 hours then rinse off with water. Repetitions: Follow this remedy 2 times a day for 2 to 3 weeks. How it works: Castor oil contains many nutrients that will helps to keep your skin healthy. Tree tea oil has antibacterial, antiviral and anti fungal in nature. It contains terpinen-4-ol, and cineol. It will helps to penetrates deep into the skin and helps to dry out the skin tags that have formed. Take a cotton ball and dip into water squeeze out the excess water. Repetitions: Repeat the above process at least 3 times a day. How it works: the antiseptic and anti fungal property of tea tree oil will helps to skin after skin tag has been removed. wait for an hour then wash water. Repetitions: Repeat the above process 2 to 3 times daily for a week. How it works: The antiseptic and anti fungal property of garlic will helps to remove the skin tags. Take onions and cut them into small pieces in a bowl add a pinch of salt to onions leave it overnight. Next morning extract the juice from salted onions with blender. Take a small amount of juice and apply on skin tags before going to bed cover with bandage. Next morning, take off the bandage and wash the area with warm water. Repetitions: Repeat the same process before going to bed for a week. Note: Use a new bandage for every application. How it works: Onion juice has acidic in nature it will helps to remove the skin tags safely. Take oregano oil and coconut oil in above mentioned quantities and mix well in bowl. Dip a cotton swab in this resultant mixture then apply it on skin tags. Wait for an hour then wash with water. Repetitions: Follow this remedy 2-3 times daily for a week. How it works: The antimicrobial, anti-inflammatory, and antioxidant properties of oregano oil helps to remove the skin tags naturally. Banana peel is also an effective remedy for removing skin tags. The antioxidant properties of banana peel help remove the skin tags naturally. Next morning remove the bandage and banana peels wash the area with water. Repetitions: Follow this remedy every night for a week. How it works: The antioxidants property and enzymes found in the banana peel can help to remove the skin tags. take a ginger slice and rub it on skin tags slowly for 1 to 2 minutes. Repetitions: Repeat the same process 3 to 4 times a day for one to two weeks. How it works: The antimicrobial properties of ginger helps to shed off the skin tags naturally. The anti-inflammatory and antioxidant properties of aloe vera is an effective home remedy to remove skin tags. Apply this gel on skin tags Massage gently for few seconds in a circular motion. Wait for few minutes till gel to be completely absorbed into the skin. Repetitions: Repeat the same process 2 to 3 times daily for 2 weeks. How it works: The healing properties of aloe vera is used to treat skin tags and also many skin problems. dip a cotton ball in lemon juice apply it on skin tags. wait for few minutes the wash with water. Repetitions: Follow this process 2 to 3 times a daily for 1 to 2 weeks. How it works: Lemon juice contains good source of citric acid it will helps to remove skin tags naturally.